Even as computer modeling and rendering grows in sophistication and usage in architectural schools and practice, models are still an important part of the design process and for presentations with clients and the public. Regarding the latter, it's been my experience that no matter how much time is spent on highly polished renderings for a meeting, the client will always gravitate towards the model, no matter how crude in comparison. Models have a tangibility that other presentation methods do not have; their multiple vantage points enable the discovery of unforeseen conditions that one-directional drawings may overlook; and their abstraction focuses attention on qualities of space and scale. As a part of the design process, they provide a fairly quick means of exploring different things, from the form of the overall building to a detail where two materials meet. Computer modeling may be more precise, but that can be a hindrance at times, and it may not yield the same discoveries that models allow. Ironically, as computer modeling becomes more sophisticated and is linked to machines like CNC routers, models can now be made with in even more ways, linked to information that is found in the computer. In this context, three recent books on architectural models attest to their lasting influence, giving architects and students alike some background on thinking and making. At the beginning of the lavishly illustrated Architectural Modelmaking are some photos of architectural models in process -- including a huge OMA model and Antoine Predock putting the finishing touches on a clay model while on a plane en route to a meeting with the client -- that convey the role of study and presentation models but also the importance of their crafting. What follows is a mix of how-to manual and catalog of precedents. 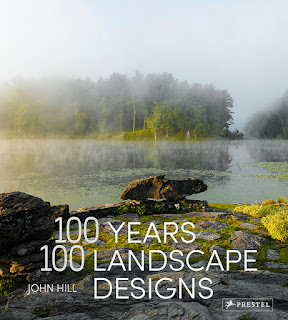 Though it leans towards the latter, with the descriptive captions that accompany the various illustrations, be they techniques, model photos, or completed buildings (the last is especially helpful to make the connection between model and full-scale result). The book is split into three sections: Media, including materials like paper, wood, steel, CAD/CAM; Types, be they concept models, massing models, presentation models, even full-size mock-ups; and Applications, such as explaining a design or testing part of it. The first is what the models are made from, the second is the model's reason for being (design study, a meeting, etc. ), and the third is the designer's intention in what the model conveys and/or achieves. Interspersed throughout these chapters are techniques and case studies, but for the most part the latter is illustrative and the former is cursory. The book amasses a plethora of images that do a good job of conveying the variety of models available today with various techniques; looking through this book makes one optimistic of the state of architecture as expressed in model form. Melissa Werner's Model Making, part of Princeton Architectural Press's Architecture Briefs series, reminds me of an old book I used to learn Photoshop; the software's well-known eye logo was shown in a manipulated form on the right side, and opposite were step-by-step directions on how to achieve that appearance. Werner, the founder of zDp Models, packs most of her book with "Concept Blocks," which are literal blocks of different materials and effects, as can be seen on the cover. Accompanying the photo of each block are materials, tools, tips and techniques, alternatives, concepts, and a photo of a sample model. The rest of the book expands on each of these, so one can flip to the back of the book to learn more about, for example, basswood, a Dremel, CNC milling (one way computer technology has created a resurgence in model building), how to bend materials, and so forth. It's a concise and straightforward how-to reference with helpful photos and illustrations, and it benefits from the apples-to-apples presentation of the concept blocks. More documentation of the sample models would have been helpful, as this appendix features the same photo at the same size as that which accompanies the relevant concept block, with architect, materials, scale, and a little bit more information of interest. Given that the concept blocks are a means to an end, not the end itself, it would be helpful, especially for students, to get a better picture of those results, which can combine materials and methods in unexpected ways. 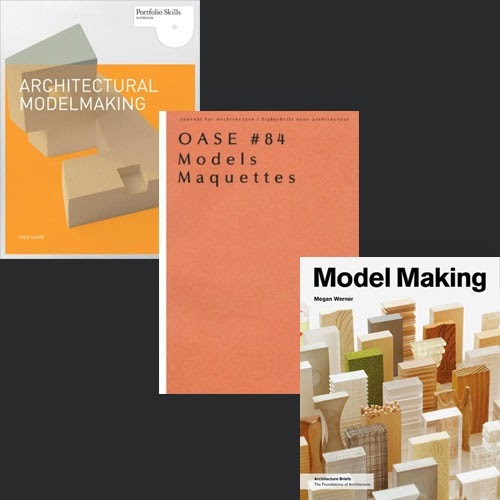 On a more theoretical spectrum than the first two books is number 84 of OASE, an independent, international journal in Dutch and English featuring architecture, urban design and landscape design, with each issue focused on a particular theme. As the editors indicate in their introduction, the term models does not solely apply to scale models of full-size buildings, either realized or soon-to-be built. 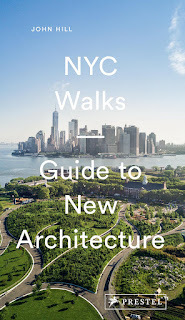 Six pairs of articles are grouped into three "observations": models can lead to unexpected discoveries divorced from the eventual building, if any; models have been an engine of change in recent architectural discourse; and models are important for a number of contemporary artists. Illustrations of each can be respectively found in John Hejduk's Wall House studies, OMA's iconic unbuilt competition projects in the 1990s, and Thomas Demand's photos of often mundane architectural spaces. Each is explored in the pages of OASE #84, as well as numerous other subjects historical and contemporary. What results are varied accounts of the role of the model in architecture and art; all, to a greater or lesser degree, acknowledge the role of the imagination in the abstract fictions that are created. Academic without being obtuse, the articles further elucidate what it is about models that makes them so popular and lasting, even as digital renderings continue their ascendancy.